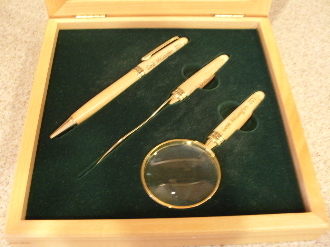 The maple set is comprised of pen, envelop opener and magnifying glass. The box measures 7.5" by 7.5" and has a glass window with the caduceus sand etched. The pen uses stand cross style refills. Please include name of doctor (max of 20 char) and allow 3-4 weeks for delivery.